I made the printable in two colors so hopefully it will work if you want to frame it yourself. I, of course, had to do one in blue and then added the gray one. Both are pretty neutral. I went to Hobby Lobby when the frames were 50% off and came home with the perfect thing. I printed this as an 8 x 10 in my printing program. You could also print as a 5 x 7 and use a smaller frame. All craft stores sell pre-cut mats and I’ve actually built up quite a collection. Very soon I will have them in all colors and all sizes. I went with blue this time but I could have easily used white too…which I had already! I love the blue though and am sure I can re-purpose it at some point. I hope you have enjoyed a beautiful, long weekend. Our weather has been the best yet. Warm days and cool nights…perfect. I’ve been counting my blessings and thinking about those in the path of Arthur. Hope you all are safe and sound. We have a very tiny front porch…not conducive to what the printable suggests, but it would be perfect for our patio. Is there anyway to change the title? Hi Ann, Thank you for sharing this lovely printable. I just love your website and I enjoy reading your blog and all the inspirational ideas and articles. Very cute!! Love that gate Ann! Hi Ann. I love this printable. We don’t have a porch but we do have a deck. Is it possible that you could make one up that says deck? You are very inspiring and I love your site. A Deck Rules printable will be no problem. Did you want the blue or gray? Hi Ann. Thanks for the email. Blue would be wonderful. Thank you. You truly inspire me. 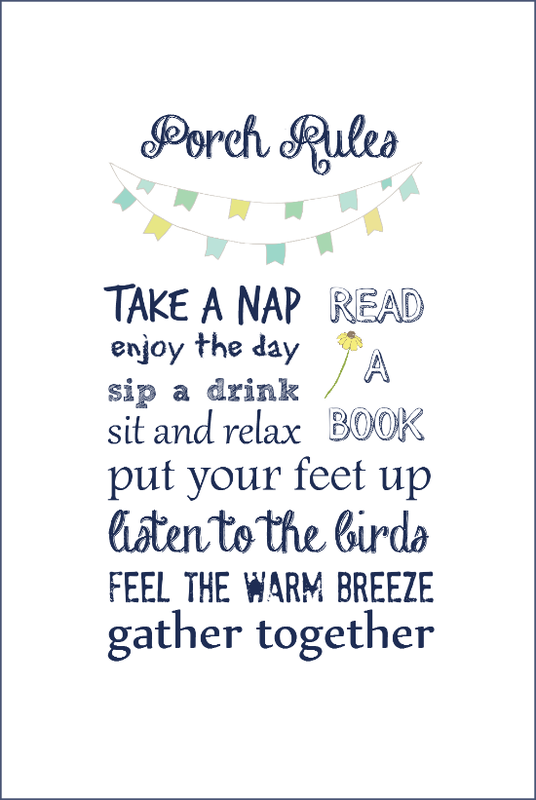 I am so glad to find this site and this cute printable….perfect for my front door and repeated on my balcony! Thank you – it is beautiful! Thanks so much for sharing. You always do a great job choosing fun fonts and graphics for your printables. 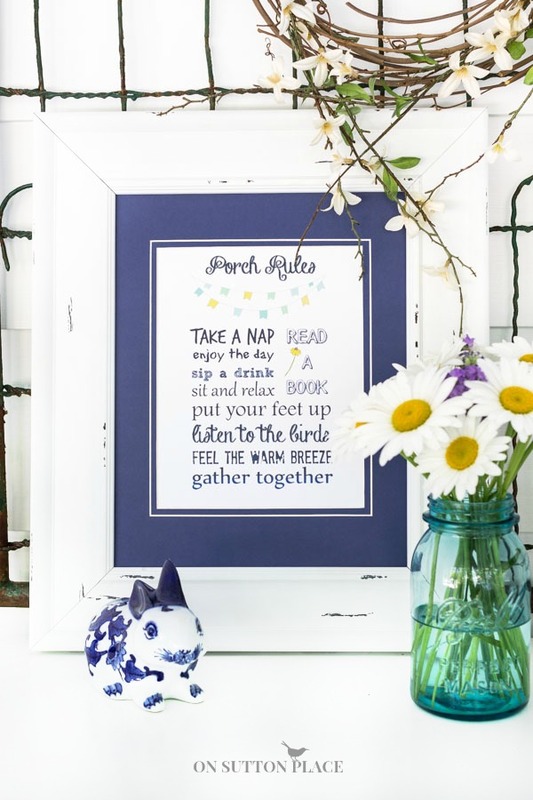 We do love those porches in the summer – and spring and fall, too. Happy Day to you! Very pretty printable. We don’t have a porch right now, but these are pretty much the rules on the sailboat when we are in port! Thanks for the printable, Ann. It will be perfect for my porch too. I just finished putting everything back together after the threat of Arthur. We just a little rain and wind, nothing more than a normal thunderstorm. The Fourth was picturesque! We are thankful it turned out that way. Have a great week! Thanks again. I love the sentiment in your Porch Rules! And I really love that wire frame on the dresser! Your framed printable looks perfect there! 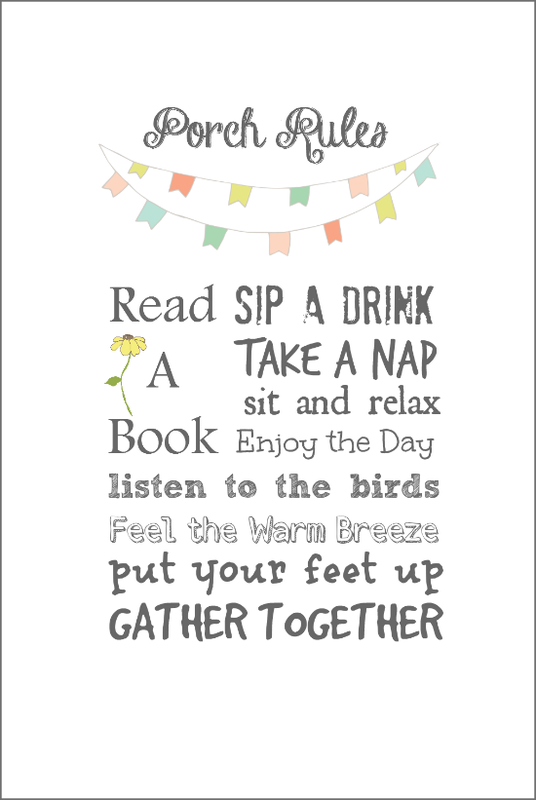 Ann, Now this is the perfect “Rule” for these lazy days of summer! And I’m going to follow it to the “T”. Thanks, Ann for another great printable! What a cute idea for the porch! Plus, I’ll make one for a friend’s birthday, sweet! Oh Ann. What a great gift. Both the sentiments and the creation. I printed it in blue, will be framing it and presenting to my cousin for her birthday in August. Thank you for your efforts and kindness. Trush you and yours had an amazing July 4th weekend. Cleveland, Ohio had blue skies, breeze and low 70’s. Just perfect for me and perfect for picnics and fireworks. I love the mix of decor items & colors! Everything flows so smoothly ,but I must say the bunny is my FAV!! Super cute & cozy! I love it Ann! 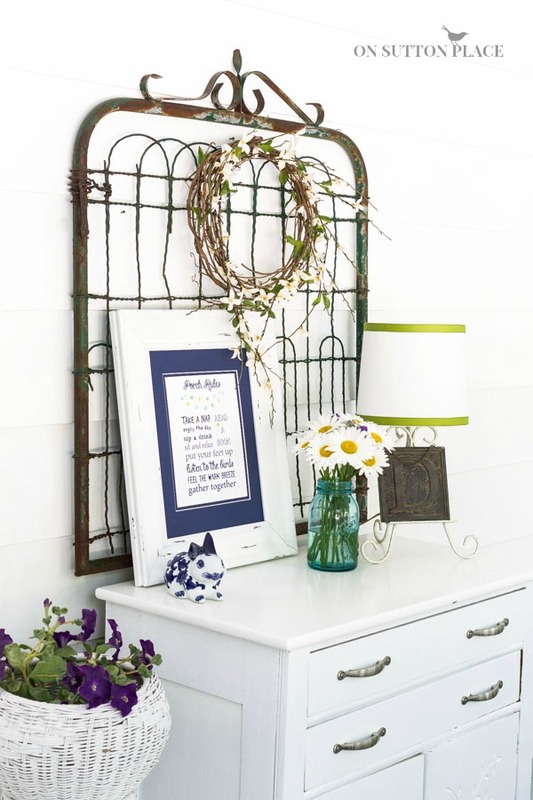 It is super cute and would look great on any porch! Your porch rules are the best. So far, summertime in Ohio is making up for winter. Hope you are well. Keep these printables coming. I need something on my porch wall…this is great, I need a new frame though, GW here I come!!! Thank-You so much I have a friends whose bday it is today and this is perfect for her!! Thanks again.. for the generosity! Thanks Ann, this is a keeper !